This book is now free on Amazon for a short time. Click here to get a copy while you still can. 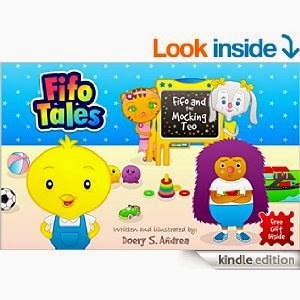 The purpose of "Fifo Tales" is that by developing emotional intelligence I want to help the future generation stand up against everyday difficulties with the help of the morals of the tales and encourage children to develop healthy self-confidence and an optimistic way of thinking. My tales make it possible for the children to process their unconscious anxiety and vent tension. This ability will help them to solve their problems when they grow up. With Fifo’s tales, my purpose is to make a series of several books. The title of the first part is ‘Fifo and the Mocking Teo’. During his several adventures Fifo, the chick boy, learns how to fight with everyday difficulties at the kindergarten. In this tale he moves into a huge city with his parents and younger sister, Fifina. In his new kindergarten he has to face an unexpected situation. He gets acquainted with Teo, the nasty hedgehog boy, who is always mocking and excluding him. Fifo’s desire is to feel good at the kindergarten and make new friends. He would like to play with Teo and wants to be his friend. He tries to be kind to him, but Teo behaves dismissively and excludes Fifo with his mocking behaviour. Charming characters and scenes make Fifo’s tales colorful and fun to follow.